Students from Columbia Crest A STEM Academy at Green Congress. Photo courtesy of Chrissy Webb. 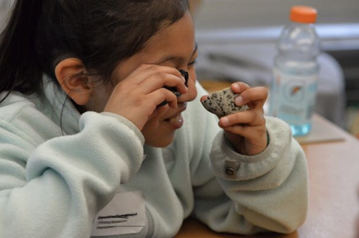 What brings together 387 students from 28 schools together to share water quality data, explore and engage in real-world science, dissect salmon, build birdhouses, and dance to catchy tunes about stream bugs? Student Green Congress of course! 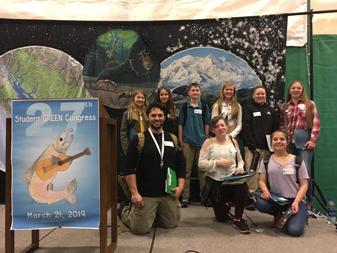 This year marked the 27th annual Congress, a major event for students from the Nisqually River Education Project and South Sound Green environmental education programs. Within the Eatonville School District, we had student delegates from Columbia Crest, Eatonville Middle, Eatonville Elementary and Weyerhaeuser Elementary attend. Students at these schools test water quality at sites near Eatonville, including the Mashel River at Smallwood Park, Ohop Creek at Burwash Farm, South Muck Creek and the Nisqually mainstem near Ashford. Green Congress serves as the culminating event for students involved in water quality monitoring programs in the Nisqually and South Sound watersheds. Classes conduct water quality tests in the fall and winter, with every class testing at different sites on creeks and rivers close to their school. During Congress, delegates from each class present their data in “State of the Rivers” sessions and collaboratively develop action projects to improve water quality in their communities. While students present objective data from their water quality testing, the subjective descriptions of their personal experiences with their watersheds and monitoring sites are inevitable, and only strengthen their relationships with each other and with their projects. These sessions are facilitated by local natural resource professionals, who offer their personal expertise to enrich the students’ discussions. “The data and authentic real-world education these teachers and students receive is leading to a more sustainable and livable community,” one facilitator perfectly described. This is our very hope for the outcome of Congress. We are so fortunate to have such great support and partners across local communities to make this a meaningful experience for students. The Evergreen State College and the Nisqually Indian Tribe provided incredible support for the event, as well as many other federal, state and local agencies, and independent and non-profit organizations. The day began with a welcome from Ellen Ebert, the Science, Environment and Sustainability Director at the Office of Superintendent of Public Instruction. Ellen related the students’ water quality testing to important policy work currently happening around the environment and local endangered orca populations. She used Greta Thunberg, a 16-year-old Swedish activist who started the youth climate strike movement, as an inspiration to reinforce the idea that young students can make a difference. Our keynote presenter, Billy B, carried on with this theme of changing behavior to change the world. Bill “Billy B” Brennen uses song and dance as an engaging teaching tool for different natural science topics. His catchy tune “The Flies in Black” had hundreds of our delegates, from different watersheds and school districts, out of their seats dancing together. Two great student MC’s, Max from Olympia Regional Learning Academy and Charlie from Komachin Middle School, kept us all on track throughout the day. The setting itself created excitement for many students. Congress is held on The Evergreen State College campus, which stirred questions about the life and experiences of college students. While the emphasis for the event was learning about various science and environmental topics, students also eagerly questioned facilitators, presenters and volunteers about potential careers and educational opportunities in natural resources. These interactions with adults--beyond just students’ teachers and family--had value in itself. Congress gives students a valuable opportunity to interact with adults in science careers, and explore different professional fields in their afternoon workshop sessions. Facilitators and workshop presenters consistently noted the fierce initiative these student delegates showed for taking action to protect or improve the water quality in their communities. We hope to continue inspiring, motivating, and empowering students to take action through events such as Congress. We are so proud of the students and teachers involved and want to give other huge thanks to all of our volunteers and supporting organizations for their hard work that continually makes Congress such an enriching event.